After much success in data center switching, Arista Networks is now trying its hand at routing. 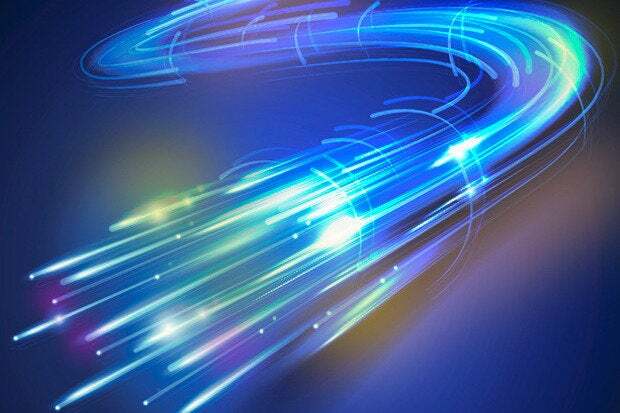 The company this week is targeting the incumbency of Cisco Systems and Juniper Networks in Internet routers with a new platform designed to bring the scale, simplicity and workload mobility of data center switching to cloud routing. The Arista 7500R is based on Broadcom’s “Jericho” silicon enhanced with routing code in Arista’s EOS operating system. 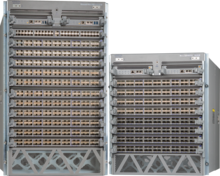 The modular 7500R features high 100G Ethernet density with large buffers to support up to 1 million Internet routes. It has a switching capacity of 115Tbps, Arista says, supports up to 432 wire-speed 100G ports, and has buffer memory 288 gigabytes deep. Like the earlier generation 7500E and its predecessors, the 7500R also features virtual output queuing to alleviate head-of-line blocking and facilitate lossless forwarding. Cisco and Juniper also support this packet queuing technique in several of their products. What sets the 7500R apart is an Arista software feature called FlexRoute. FlexRoute is the software that allows the 7500R to support an Internet routing table of 1 million routes, and routing protocols such as BGP, MPLS, Segment Routing and Ethernet VPN, as well as VXLAN routing and MACSec encryption. FlexRoute and EOS allow the 7500R to perform programmable traffic engineering with up to 128,000 MPLS, GRE, VXLAN and IP-in-IP tunnels, Arista says. Packet lookup is 13 MPLS labels deep, and reconvergence time on the 7500R is 200 ms vs. 2 seconds for traditional routers, the company says. FlexRoute is in trials with NetFlix and other Tier 1 service providers. New line cards for the 7500R include 36x100G QSFP, which support 10/25/40/50 and 100G Ethernet; 36x40Gwith combinations of 10G and up to six ports of 100G; and 48x10G SFP+ and 2x100G QSFP. The 7500R chassis can support earlier generation 7500E line cards but FlexRoute will only work on the new 7500R line cards, according to Arista. Arista says evolving traffic patterns in data center and cloud have rendered traditional core routing ripe for replacement with a platform of 7500R’s caliber. The company says its state-oriented NetDB database and EOS software development kit allow cloud providers to customize their own preferred paths across the Internet instead of relying on best-effort forwarding. But the incumbent router vendors have been working for years on tight integration of packet and optical transport. Arista has some capabilities here, with its Spine Transit line card and relationship with Infinera, but Cisco and Juniper develop custom ASICs and silicon photonics specifically for packet/optical transport. Arista is confident it won’t face short term competition in Internet routing from the Facebook-initiated Open Compute Project, though. The company’s stock plummeted recently after Arista customer Microsoft demonstrated its SONiC software running on whitebox switches, which some analysts viewed as a potential threat to Arista. The four- and eight-slot 7504R and 7508R, and the new 7500R line cards are available now. The 12-slot 7512R will be available in the third quarter. Prices start at $3,000 per 100G port.